The Azrieli Music Project (AMP), a Canadian philanthropic organization, announced that composer Wlad Marhulets is the winner of the inaugural Azrieli Prize in Jewish Music for his Klezmer Clarinet Concerto. Marhulets, who submitted a completed orchestral work on a Jewish theme or subject – along with applicants from around the world – has been granted the second of two $50,000 prizes, which were offered for the first time by the Azrieli Foundation. 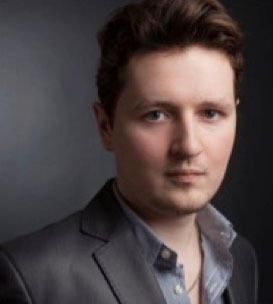 In September 2015, the Azrieli Music Project announced that Brian Current was the winner of the inaugural Azrieli Commissioning Competition for Canadian composers. Marhulets’s 2009 concerto and Current’s newly created work, The Seven Heavenly Halls, will both be performed at the Azrieli Music Project Inaugural Concert by Orchestre symphonique de Montréal and Maestro Kent Nagano on Wednesday, October 19, 2016 at Maison symphonique de Montréal. Wlad Marhulets (b. 1986) describes his Klezmer Clarinet Concerto as the most important work of his career. Born in Minsk, Marhulets moved with his family to Gdansk, Poland, as a child. It was there, at the age of 16, that he first heard a recording by the acclaimed klezmer clarinetist David Krakauer. “Listening to this modern reinvention of klezmer music changed my life,” says Marhulets, who immediately picked up the clarinet and formed his own klezmer band. Before travelling to New York City, with the goal of meeting Krakauer, the twenty-year-old composer – who barely spoke a word of English – also sent his compositions to John Corigliano. The Oscar- and Pulitzer Prize-winning composer immediately took Marhulets under his wing at the Juilliard School. Marhulets’s Klezmer Clarinet Concerto was premiered by David Krakauer and the Detroit Symphony Orchestra in 2009, under the baton of Maestro Andrew Litton. The concerto has since been performed by the National Orchestra of Lyon and the Bialystok Symphony in Poland. Dr. Sharon Azrieli Perez comments, “I am truly delighted by the jury’s choice for the inaugural Azrieli Music Prize, which was selected amongst applications from across the globe and from composers of all ages, affiliations and faiths. The Klezmer Clarinet Concerto is a dynamic work that is entirely modern, yet hearkens back to traditional Jewish music. In Wlad Marhulets, we have a young composer who is poised for a major career.” The jury for both Azrieli Music Project prizes consisted of conductor Boris Brott; composer Aaron Jay Kernis; musicologist Neil Levin; conductor and composer Steven Mercurio; and composer Ana Sokolovi?. Now based in Los Angeles, Wlad Marhulets has been gaining great acclaim as both a concert and film composer. Marhulets has composed music for such ?lms as The Orchestra of Exiles (an acclaimed documentary about the creation of the Israel Philharmonic Orchestra, directed by Oscar nominee Joshua Aronson), The Giver, The November Man, and Sabotage, among others. His notable concert works include The Property, a “Klezmer Opera” commissioned by Lyric Opera of Chicago; the oratorio Return, written for the beginning of the Polish Presidency in the European Union; and the string quartet “Dybbuk,” written for the JACK Quartet, and also performed by the Kronos Quartet. Marhulets has received the Susan W. Rose Fund Grant, the Peter D. Faith Prize, and ?ve ASCAP Awards, including the prestigious Leonard Bernstein Award. He is currently working on a symphonic piece commissioned by the Festival of Jewish Culture in Krakow, to be performed this June. The Azrieli Music Project Inaugural Concert featuring Wlad Marhulets’s Klezmer Clarinet Concerto and Brian Current’s The Seven Heavenly Halls will take place on Wednesday, October 19, 2016 at Maison symphonique de Montréal with the Orchestre symphonique de Montréal, the OSM Chorus and Maestro Kent Nagano. Complete programming and soloists will be announced soon. Tickets ($40-$100) are on sale now at OSM.ca. The Azrieli Foundation is a Canadian philanthropic organization that supports a wide range of initiatives and programs in the fields of education, architecture and design, Jewish community, Holocaust commemoration and education, scientific and medical research, and the arts.